Former Gov. Ed Rendell announces he has Parkinson's disease during a news conference at Pennsylvania Hospital in Philadelphia, PA on June 18, 2018. Former Pennsylvania Gov. Ed Rendell, 74, announced Monday morning that he has Parkinson's disease, but that his symptoms have been stabilized with aggressive treatment. "The reason I'm going public today, I want to send a message" to people with symptoms, he said during a news conference at Pennsylvania Hospital. "Get in to see a doctor, get a diagnosis, and get treatment. Parkinson's disease is not a death sentence." Although Rendell appeared to have some difficulty rising from his chair and a slight shuffle as he walked to the microphone, he blamed his arthritic knees. Former Gov. Ed Rendell gets help from his doctor, Matthew Stern, before announcing that he has Parkinson’s disease during a news conference at Pennsylvania Hospital. Rendell said he had begun having symptoms including a slight tremor 3½ years ago, and sought medical attention at the urging of his family. He went to see Matthew Stern, director emeritus of the Parkinson's Disease and Movement Disorders Center at the University of Pennsylvania. Stern appeared with him on Monday, along with Penn president Amy Gutmann and other Penn officials. "I was stunned because I'd always viewed myself as indestructible," said Rendell, an alumnus of Penn and Villanova Law School. Initially, he feared he would deteriorate quickly like his mother, who was diagnosed with Parkinson's at age 76 and struggled with it for the last 13 years of her life, winding up in a wheelchair. "I saw what it did to my mother," Rendell said. In addition to taking Parkinson's medication, Rendell began rigorous physical therapy with Heather Cianci, a specialist at the Parkinson's Rehabilitation Center at Pennsylvania Hospital. He also works out two times a week with a trainer at the Sporting Club at the Bellevue. "I'm convinced this has worked to significantly slow the progression of the disease," the former governor said. >>READ MORE: Do you know the symptoms of Parkinson's disease? Stern, his physician, echoed that sentiment. "I wanted the governor to do this for some time," Stern said of the public announcement. "One of the key messages the governor brings today is that …. with the right combination of medication and therapy, you can live a full and active life. The governor is an inspiring example of what Parkinson's disease looks like today." Rendell was governor of Pennsylvania from 2003 to 2011, and mayor of Philadelphia from 1992 to 2000. He became the city's youngest-ever district attorney when he was elected to the post in 1977 at age 33. >>READ MORE: Neil Diamond announces he has Parkinson's disease. In 2012, Rendell received an award from the Bala Cynwyd-based Parkinson Council for his advocacy work. He said then that he was inspired by his mother's battle with the progressive neurodegenerative disorder, which mostly affects the dopamine-producing neurons in the brain. The cause remains largely unknown. The disease causes tremors, walking and balance problems, and muscle rigidity. These symptoms may be accompanied by thinking and behavior changes and, in late stages, dementia. Gov. Wolf and his wife, Frances, issued a statement soon after Rendell's announcement. "Pennsylvania has seen few leaders as tough as Ed and we have full confidence that neither has Parkinson's disease. Ed should know that the entire commonwealth is standing behind him and hoping for the continued success of his treatment and therapy. As he always has, he is putting others first by going public with his diagnosis so others can also get the help they need." Rendell said he takes Levodopa, a cornerstone of drug therapy because it replenishes the brain's dopamine supply, and a drug called Rasagiline, which inhibits the breakdown of dopamine in the brain. As mayor and governor, Rendell was famous for his ability to keep a grueling schedule on four hours of sleep a night. He said he has barely slowed down, traveling 15 days last month to speak and champion his causes, which include alternative energy and government efficiency. Although Parkinson's is incurable, Stern said there is "tantalizing data" from studies that suggests physical therapy has a beneficial effect on the course of the disease. During an interview after the press conference, Rendell added that mental attitude is an important part of coping with the disease. "When I work out, I feel better. I feel like I'm making progress," he said. Rendell's announcement reverberated around the Capitol, where everyone from his biggest supporters to his former rivals paused to recall their best Rendell story and wish him well. Steve Crawford, Rendell's onetime chief of staff who now heads the Wojdak Government Relations lobbying firm, called his former boss "an eternal optimist" with a "work ethic that is almost unmatched" — traits that will help him going forward. "He is literally the hardest working person I have ever encountered," Crawford said. "You never, ever count him out. And I think that I'd be the last person to count him out on this fight." Chuck Ardo, once Rendell's spokesperson in the Capitol, said Rendell is not someone who would easily share his health challenges because he would not want people to feel sorry for him. 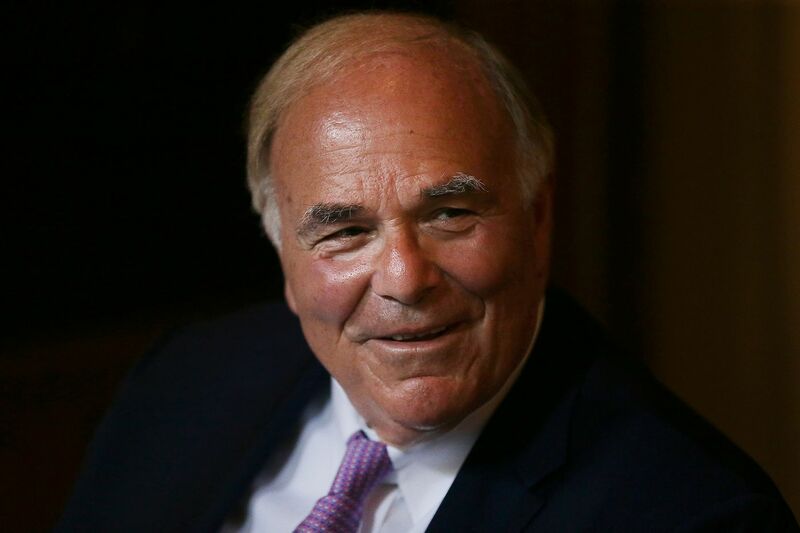 "But one of Ed Rendell's great strengths as a political figure was his enormous courage — and I think that he will face this next chapter of his life with that same courage and determination." Senate Majority Leader Jake Corman (R., Centre) said in a tweet that Parkinson's "could not have a more formidable adversary."